Israel’s northern front is perpetually under threat from hostile neighbors and internal terror. There often are reports of tensions and peril between Israelis and their adversaries. However, there is one beacon of hope and promise. At Rambam Medical Center in Haifa, physicians performed Israel’s first-ever “crossover kidney transplant,” where a patient’s family member donates a kidney to another recipient whose relative donates a kidney in return to the first patient. It is a revolutionary alternative transplant surgery when no blood relative is a suitable match for donation. The story is more intriguing. Haifa residents Muhammad Akrat, 32 and David Ben-Yair, 57, had never met before they shared a hospital room following a kidney transplant on May 21. In a three-hour surgery, Akrat’s wife Rasha gave her kidney to Ben-Yair, and in return, her husband received a kidney from Ben Yair’s son Shmuel. "Whoever saves a life is sacred, whether Jewish or Arab. G-d's blessing will prevail," said Muhammed Akrat about this extraordinary procedure. David Ben-Yair added, "Here in our country and in the world, we need to understand the power we have to save people, all people. Donate. Help. We got another chance. Give it to others." David Ben-Yair’s message runs true. Rambam has a history of providing medical care to diverse populations. Last fall, during Operation Cast Lead, Rambam, the second largest transplant center in Israel, took care of four seriously ill Gazan children who were awaiting kidney transplants despite Israel being subjected to continuous rocket fire from the Gaza Strip. In calm before an impending storm, the hospital is investing in ways to best serve the residents of Northern Israel in times of crisis. “Despite us being a model of coexistence, in 2006 Haifa, yet again, found itself under fire from the Hezbollah in Southern Lebanon,” explained Beyar. “With over two million civilians, soldiers and peacekeepers reliant on our care, we needed to find a way of protecting our patients.” Rambam has been building a fortified underground parking lot that can convert within 72 hours 1,500 parking spots into a 2,000-bed acute emergency hospital protected from chemical and biological warfare. When completed, the Sammy Ofer Fortified Underground Emergency Hospital will be the world’s largest underground hospital. This seemingly ordinary parking lot is far from conventional. It is stocked with its own power source, water supply, generators and modern medical equipment. Friends of Rambam, worldwide, have been garnering support for this momentous project and Beyar says that Rambam is now beginning its final push to equip this underground hospital for use when needed. 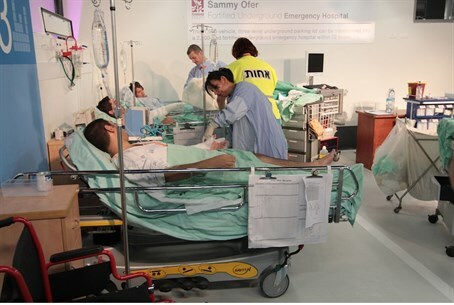 Rambam’s innovative strides in medical care and emergency response not only save lives, but unite disparate nations.